Bonus Bingo Card Guide & Review - Casino Answers! 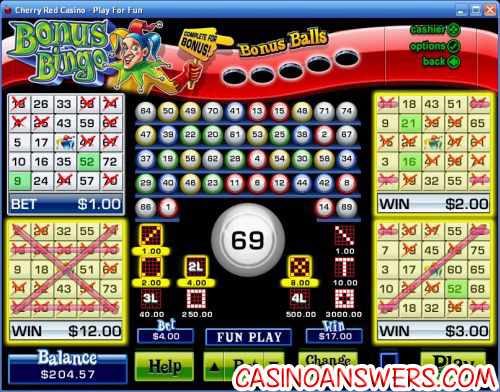 Bonus Bingo is a 4-card casino bingo game with a bonus round developed by Realtime Gaming. You can play Bonus Bingo at Cherry Red Casino and Club USA Casino.Play at this years #1 online casino for United States - Slots.LV. Patterns on Bonus Bingo are diagonal lines, four corners, an ‘X,’ a ‘T,’ 2 lines, 3 lines, 4 lines, perimeter, and the entire card except the four squares around the center. The 2, 3 and 4 lines patterns must be horizontal only. Bonus Bingo pays all overlapped prizes except ones totally covered by a greater prize. For example, when you win a perimeter, you are also matching four corners. This is not paid because it is entirely covered by the perimeter pattern. Plays can be awarded with a multiplier. You will have the option of choosing which card you wish to use the multiplier on. The card will be multiplied by 2X or 3X the original winnings. Bonus Bingo also has a special mystery balls feature. With all four cards turned on, Mystery balls will be drawn randomly at any time during play. These special balls will award you with extra credits. Last but not least, Bonus Bingo gets its name from the game’s bonus round. With all four cards turned on, complete a set of five special balls and win a passage to the bonus round. In the bonus round, you can win up to 150X the card bet. The bonus multiplier is an average value based on the previous bets before the bonus round. Bonus Bingo is a fun game of bingo that is definitely something different from most online casino games out there. Bonus Bingo’s presentation, including the graphics, sound effects and layout are all top-notch. All of these add to the play value and make it even better than it already is. The game is very easy to play. You will get the hang of it instantly. To get up to $7,777 in bonuses to play Bonus Bingo, please visit Cherry Red Casino. Can Americans play Bonus Bingo at Realtime Gaming online casinos? American casino players are in luck! Most RTG casinos are US-friendly, including both Cherry Red Casino and Club USA Casino. Are there any bingo card games?